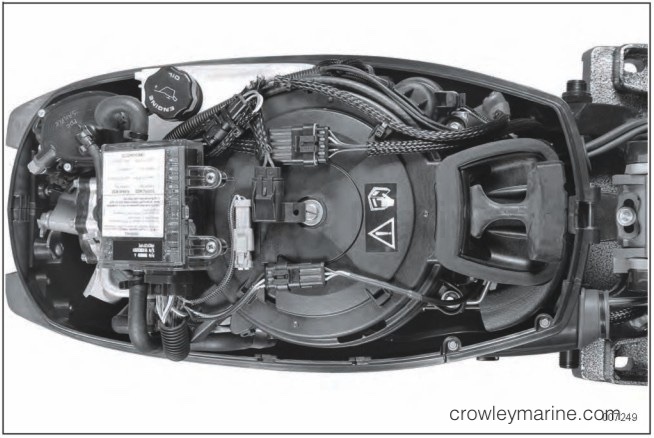 This electric start kit is designed for use on 2009 (SE) through 2011 (II) 25-30 HP Evinrude® E-TEC® outboards. DO NOT install on any other models. 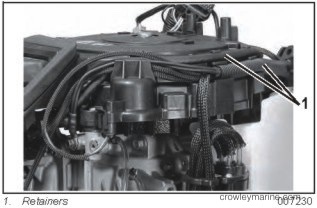 To prevent accidental starting during installation, twist and remove all spark plug leads. 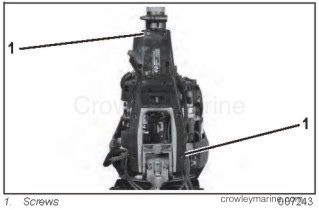 Remove the electrical connectors from the recoil starter housing. 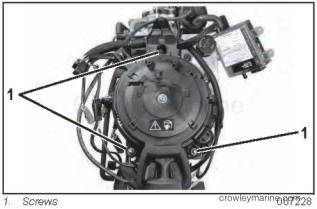 On 2010 or older models, remove the touch troll connector and retainer from the cooling hose. 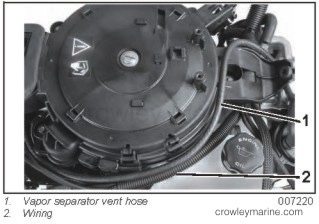 Remove cooling hose from the EMM and the overboard indicator. Remove tie straps and discard cooling hose. 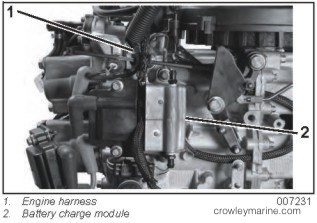 Remove the Electronic Management Module (EMM) mounting screws. Remove the EMM. Position the EMM to the side. 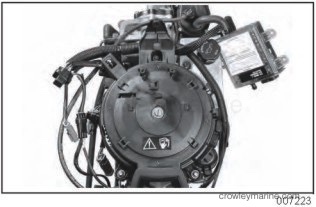 Remove the vapor separator vent hose and wiring from the recoil starter housing. Remove the recoil starter mounting screws and remove recoil starter assembly. Remove flywheel nut and washer. Use universal puller, P/N 387103, to remove flywheel. Lightly coat threads of flywheel nut with Triple Guard grease. 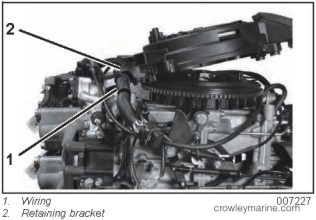 Align the flywheel key in groove of crankshaft. Position the wiring in the retaining bracket of recoil starter housing. Install recoil starter assembly. 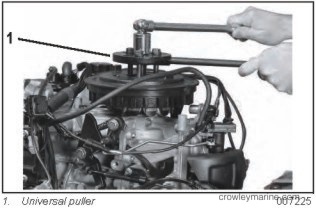 Tighten mounting screws to a torque of 31 to 48 in. lbs. (3.5 to 5.5 Nm). 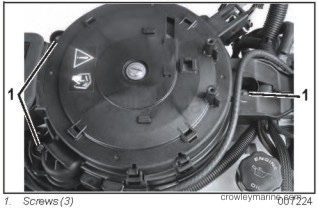 IMPORTANT: Prevent damage to wiring from rotating flywheel, make sure stator connector is securely fastened to the starter housing. 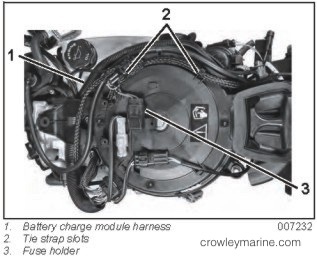 Install stator connector in retainer groove of starter housing. 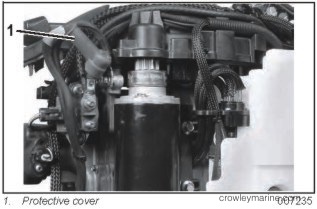 Position the vapor separator vent hose and wiring in the retainers on the recoil starter housing. Install the isolators and flanged spacers on the battery charge module as shown. 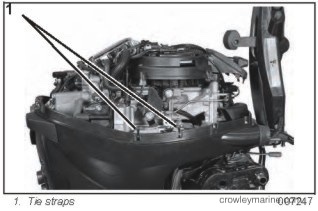 Cut the existing tie strap holding the engine harness and insert a new tie strap as shown. 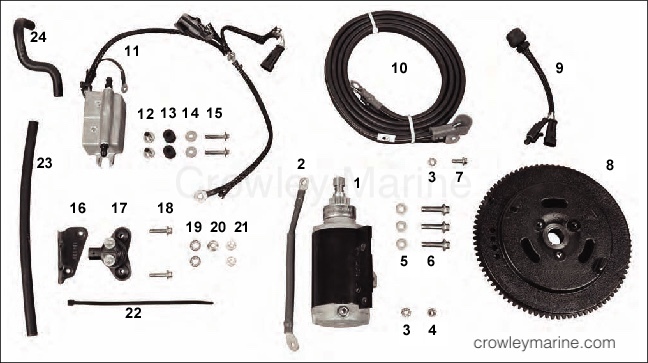 Install the battery charge module on the crankcase assembly with 6 x 30 mm screws and the large 6 mm washers. Tighten screws to a torque of 31 to 48 in. lbs. (3.5 to 5.5 Nm). Tighten tie strap to secure both the engine harness and the battery charge harness. Connect battery charge module harness to engine wiring harness. 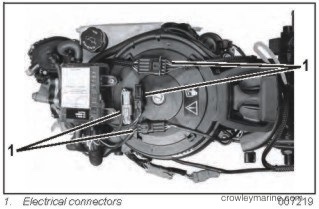 Route harness under the EMM and over the recoil starter housing. Position the charge module harness, connectors and wiring as shown. Assemble and tighten tie straps through the tie strap slots of the recoil housing. Attach fuse holder to retainer. 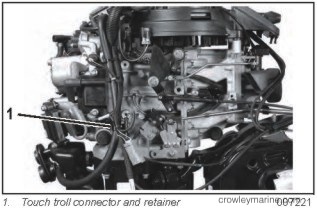 Attach remaining connectors to retainers on recoil housing as shown. 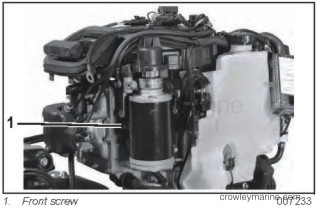 Install the electric starter on the crankcase assembly. Install and tighten the front screw first. Torque all three screws to 128 to 146 in. lbs. (14.5 to 16.5 Nm). 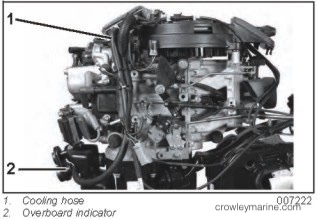 IMPORTANT: Check the oil hoses are NOT pinched behind the electric starter. 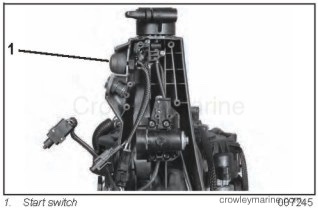 Remove the screws from the intake manifold. 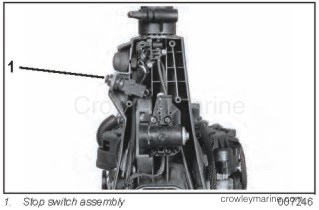 Install the solenoid bracket as shown using the same screws. 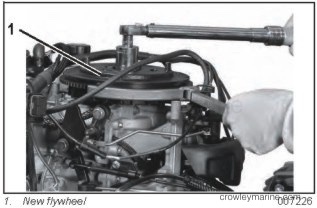 Tighten screws to a torque of 84 to 106 in. lbs. (9.5 to 12 Nm). Install negative battery cable using the 6 x 16 mm screw and lock washer. Tighten screw to a torque of 31 to 48 in. lbs. (3.5 to 5.5 Nm). 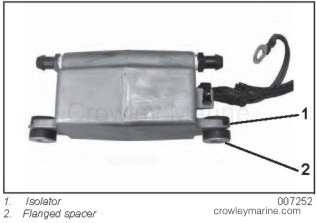 Install starter solenoid on solenoid bracket with two 6 x 25 mm screws. Tighten screws to 31 to 48 in. lbs. (3.5 to 5.5 Nm). 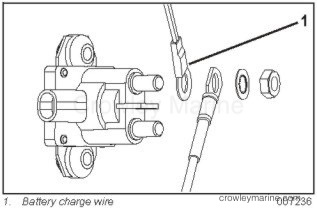 Install the battery charge wire, positive battery cable, lock washer, and solenoid nut on upper solenoid terminal. Install protective cover on positive battery cable. Tighten solenoid nut securely. 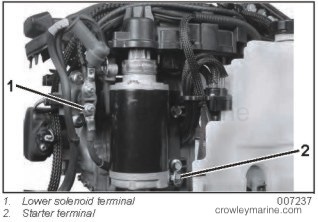 Install the starter cable, lock washer, and nut on the lower solenoid terminal. Install starter cable, lock washer, cable and nut on the starter terminal. 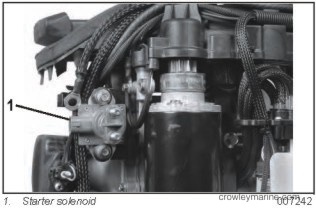 Tighten solenoid and starter terminal nuts and apply liquid neoprene to seal terminals. Remove solenoid connector from storage location and connect to starter solenoid. Use a tie strap to secure the cables as shown. Position the EMM on the starter housing. Install and tighten self-taping screws carefully. IMPORTANT: Turn self-tapping screws counter clock-wise to start the threads and clockwise to tighten. 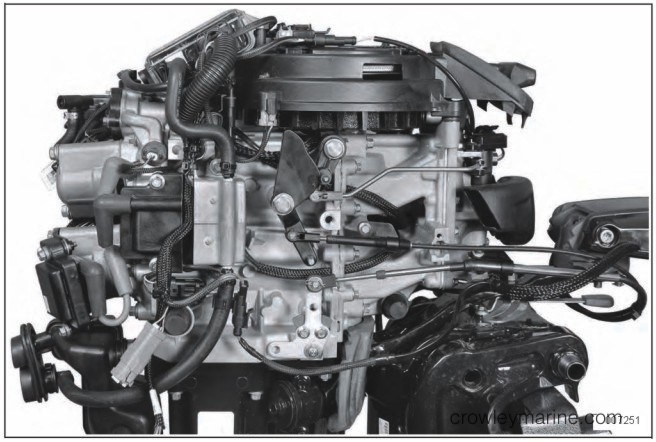 Failure to follow this procedure can damage the threads of the housing. 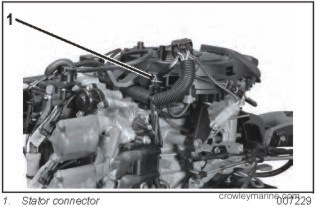 Connect the cooling hose (P/N 353918) from the EMM to the battery charge module as shown. Secure with tie straps. 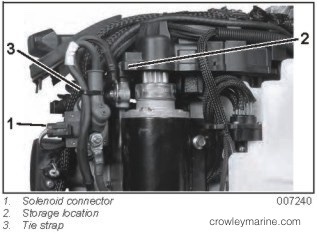 Connect the cooling hose (P/N 353917) from battery charge module to the overboard indicator fitting (exhaust grommet fitting). Secure with tie straps. 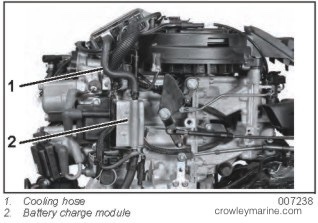 On 2010 and older models, attach touch troll connector and retainer to straight hose. Install lower engine covers. 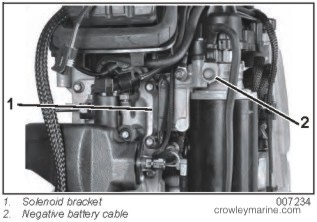 Route battery cables through port lower engine cover. 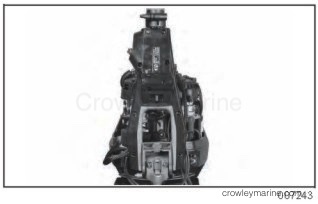 Remove steering arm cover screws (8) and cover. 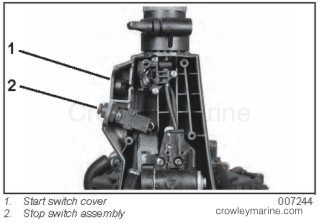 Remove start switch cover and stop switch assembly. Slide start switch wiring through slot and install start switch. Reinstall stop switch assembly. 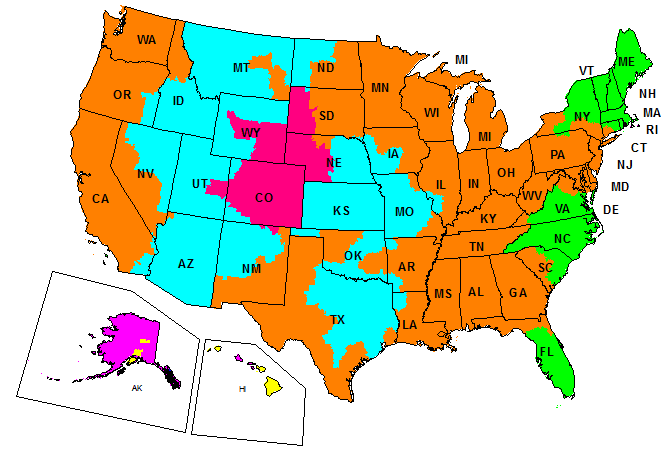 Route wiring as shown. Check wiring is not pinched. Secure wiring to prevent contact with moving parts. Contact can cause outboard damage or personal injury. Install steering arm cover and screws (8). Reinstall lower engine covers. 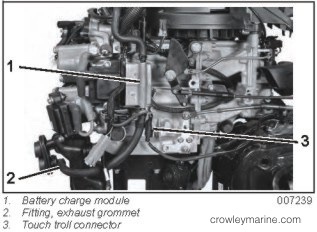 Route battery cables through the grommet on the port side of the lower engine cover. 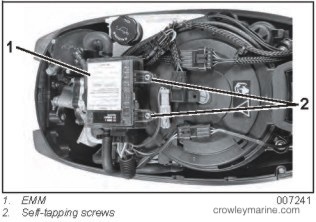 Secure MWS connectors to starboard cover with tie straps. Seal tie strap holes with tape. 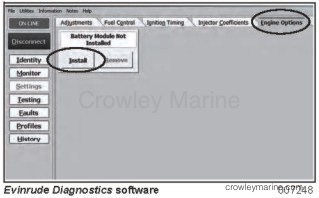 Use the “Engine Options” feature of Evinrude Diagnostics software to select “Install” Battery Module. Run outboard and test operation. Check for proper operation of start-in-gear protection, emergency stop switch, battery charging and stop switch, and electric start. 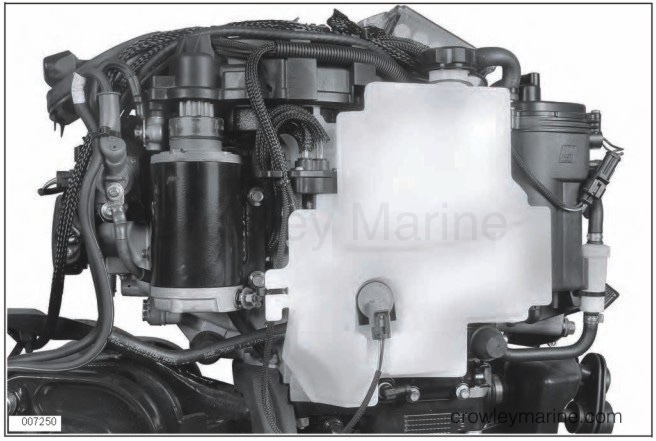 IMPORTANT: Instruct owner on the operation of the electric start and battery charging features. Advise owner to refer to the operating instructions in the operator’s guide.